A great ode to tenor guitars of years past with modern craftsmanship. 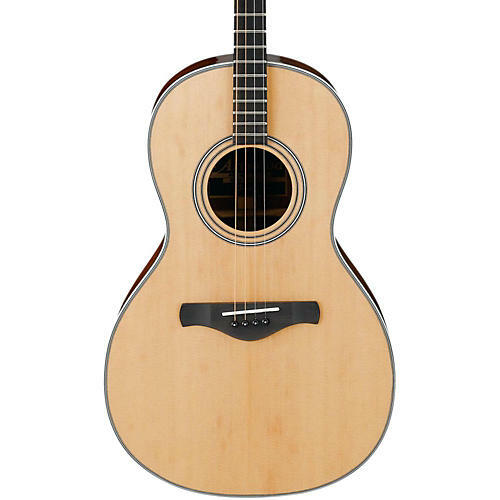 Ibanez has long described Artwood as a "modern approach to acoustic guitar tradition." Now, with the 22.8" scale AVT1NT Artwood Vintage Tenor Acoustic Guitar, Ibanez delves fathoms deeper into guitar building tradition. The AVT1NT promises to return the tenor guitar back to it's rightful place in the folk instrument pantheon. It features a bone nut to deliver a well-balanced sound and a bone saddle on a distinctively contoured rosewood bridge. Ideal for strummers and traveling musicians who want to keep their chops up, this smaller-bodied guitar gives you plenty of tone and projection despite its smaller frame thanks to the combination of solid Sitka spruce top, magohany neck, back and sides, and rosewood fingerboard. Other appointments include a black and white multi-rosette, and open gear tuners with pearl buttons. You can really take this with you wherever you go. Just buy it first. Order today!